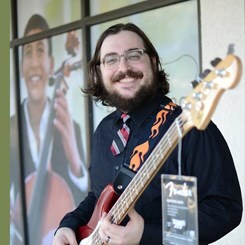 Hi my name is Sam and I'm the full time senior sales associate and Lesson Coordinator at the Timonium Music and Arts. Music has always played an important role in my life. I started singing in middle achool, picked up piano and bass in high school, and guitar in college. I received my Bachelors Degree in Theatre Studies from Towson University and I also have an Associates Degree in General Music from Carroll Community College. When not working at Music and Arts, I enjoy binge watching tv shows/movies and creating music with my wife.